30 by 53 in. 76.2 by 134.6 cm. 30 by 38 5/8 in. 76.2 by 98.1 cm. each print: 30 by 39 7/8 in. 76.2 by 101.3 cm. Martha Rosler Mitchell-Innes & Nash Chelsea September 6 – October 11, 2008 July 10, 2008 – New York: Mitchell-Innes & Nash announces an exhibition of new work by Martha Rosler, on view in its Chelsea gallery from September 6 to October 11. This will be Rosler's first solo show with Mitchell-Innes & Nash since joining the gallery in 2005. The exhibition will include a group of new photomontages, as well as new sculpture. 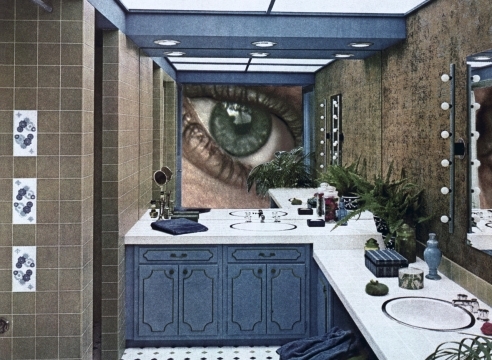 Martha Rosler has been an important figure in art since the 1960's, contributing groundbreaking works in media including video, photography, installation, performance, photo-text and critical writing. Her work addresses social life and the public sphere, often staking out feminist and anti-war positions. She has been included in numerous international exhibitions, most recently WACK! Art and the Feminist Revolution at The Museum of Contemporary Art, Los Angeles, PS1 in Queens, and other venues, UnMonumental at The New Museum in New York, Documenta 12 and Skulptur Projekte Münster, all in 2007; and Ambitions d'Art at Institut d'Art Contemporain in Villeurbanne, France, in 2008. Her solo exhibition Location, location, location is on view at Portikus in Frankfurt. Her comissioned 'reinvention' of Allan Kaprow's Words (1962) is on view in the exhibition Action/Abstraction at the Jewish Museum, New York. Among Rosler's best-known works are her photomontages from the series Bringing the War Home: House Beautiful (1967-72), which set war scenes against images of domestic comfort and high design. In the wake of the U.S. invasion of Iraq, Rosler revisited the photomontage format, updating it to reflect the new spaces and technologies of war and its representations. A retrospective of Rosler's work was shown in five European cities and in New York at the New Museum and the International Center of Photography in 1998–2000. A solo exhibition of her photomontages was held at the Worcester Art Museum in Massachusetts in 2007. Her writing has been published widely in catalogues and magazines, and she has published 14 books, in several languages, of photographs, texts, and commentary. Decoys and Disruptions: Selected Writings, 1975-2001, a book of Rosler's essays, was published by the MIT Press in 2004 (reprinted, 2008). Other projects include the Martha Rosler Library, a traveling exhibition comprising 8,000 volumes from Rosler's collection, currently on view in Liverpool and opening in August at Stills in Edinburgh. Martha Rosler was born in Brooklyn, where she lives and works. She holds an M.F.A. from the University of California, San Diego, and a B.A. from Brooklyn College. Her work is in the collections of major international museums, including the Metropolitan Museum, the Whitney Museum, the Museum of Modern Art, and the Guggenheim in New York, the Art Institute of Chicago, the San Francisco Museum of Modern Art, the Art Gallery of Ontario, Victoria and Albert Museum in London, and the Generali Foundation in Vienna, among many others. She has lectured extensively in the U.S. and abroad.